Abrasion Resistant Ceramic Lined Pipes have been uniformly produced by a thermite reaction induced under the influence of a centrifugal force (“Centrifugal Thermite Process”) without any high-temperature furnace facilities. The characteristic feature of the present process for forming uniform ceramic layers is in its reaction propagation as well as the reaction heat and centrifugal force. 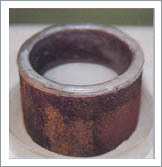 It is very important in improving the quality of the ceramic lined pipes to find the proper conditions of the reactant and centrifugal force; the former mainly determines the produced ceramic layer quality and the latter the achievement of layer separation and the mechanical properties of the pipes. Ceramic lined tube has great resistance against corrosion, abrasion and thermal shock. The ceramic lined steel pipes are lighter than alloy pipes, cast iron pipes, and cast stone pipes and can be welded or connected through flanges, which reduces the expense of transportation and makes the pipes easier to install. For the pipes with the same sizes, types and length, the weight of ceramic pipe is about 1/2 of the wearable cast alloy steel pipe's, while the cost has reduced 10%~20% per meter. The weight of ceramic lined steel pipe is about 1/3 of the cast stone bent pipe's, 1/2 of the cast stone straight pipe's. Elbow angle: 22.5, 45, 60, 90, 120, 135, 150 degrees, etc. Four way pipes: straight cross, reducing cross.